The practice of stage magic is undeniably cool and has always aroused suspicion as well – what criminal means could shady magicians put their befuddling skills to? There is a great movie in that. 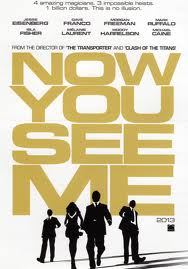 A pity then that Now You See Me (2013), with an absurdly good cast, is definitely not that great movie. It all goes pretty badly right from the start, with the film only ever slightly improving from its terrible and tacky start. The plot sees a band of top class magicians recruited by a shadowy unknown figure to pull of a number of (supposedly) spectacular heists that target the ‘one percent’. 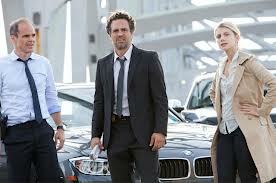 A cop, played by Mark Ruffalo, attempts to take them down, and the whole thing culminates in a craptacular twist that you will have either seen coming from way off, or you will just not particularly have cared enough to even think about. Oh and there is an absolutely terrible love story subplot that will convince no one. One of the major disappointments for me was the presentation of the actual magic tricks. Hearing that the entire cast had undergone extensive magic training I was psyched for some good old school trickery. Unfortunately they opted for the new school trickery of CGI, which simply does not work in this setting. If the story could not be told through tricks that could be performed practically, then the story should have been changed. I am not really sure how, but the makers of this film managed to attract quite an incredible ensemble cast to what is a pretty miserable script. Jesse Eisenberg, Isla Fisher, Woody Harrelson, Mark Ruffalo, Dave Franco, Michael Caine, Common, Melanie Laurent and Morgan Freeman all feature. They all do at the very least reasonable work here, with material that rarely rises to the level of reasonable and I don’t think ever beyond. Eisenberg is perhaps the best of the lot. He manages to create a really fleshed out character, at various times neurotic, eccentric, controlling and seemingly a master magician. Brother of James, Dave Franco continues to show that he is a pretty gnarly dude and brings a real presence to his role here. Freeman and Caine are of course good, but their characters are two of the weakest. Freeman’s especially, which if it had of been well written, would have been a really intriguing window into the world of magic, is really disappointing. Utter rubbish such as this is much more enjoyable when performed by actors of this quality. Given how little I enjoyed the end product though speaks a lot to just how poor the material they were working with actually is. The direction and technical aspects of the film are totally bland and even worse, just by the numbers stuff which cannot elevate the film at all, whilst decisions such as those around the use of CGI actually leave the film a fair bit poorer. 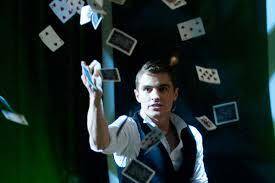 One of the silliest films I have seen for quite some time, Now You See Me did pretty much nothing for me. There were some moderately intriguing plot points and a really good cast. But the bad definitely outweighed the good on this one. The film surprisingly went great guns at the box office and as such director Louis Leterrier will have the chance to improve on this tepid effort when a sequel shoots in 2014. What a muddled mess. I agree with your review. Yep, very little to enjoy except for a couple of little bits at the start. Muddled is a good word for it. Great review. And completely review. The plot of this flick is a jumbled mess, and the fact that it’s getting a sequel a real shame. Thanks for commenting and yep, garbage is spot on. The biggest surprise for me is just how well this performed at the box office. Just struggle to see why there was any attraction for people. I assume part of its box office success is in its release date. In late May, the summer blockbuster blitz is only beginning, so there aren’t that many big-studio options yet. The cast is likely part of the explanation as well. But neither explains all of its success, which is to say I don’t really get it either. Great review, but I strongly disagree. Granted, I didn’t see a lot of movies in 2013 but this is probably the one I enjoyed the most. I didn’t buy the romantic relationship either but I thought it was immensely entertaining. Thanks for sharing Fernando. Interesting you liked this one. I was pretty into it for the first 20 or so minutes as they set up the band of magicians. But after that it pretty much lost me I have to say. Well, to each his own. I had soooo much fun. Good review. This movie was fun for quite awhile, but that final twist just really pissed me off. Made no sense, and I don’t think it was even supposed to. It was just another one of Hollywood’s dirty tricks. Oh yeah the twist was a definite low point. Thanks for commenting man.